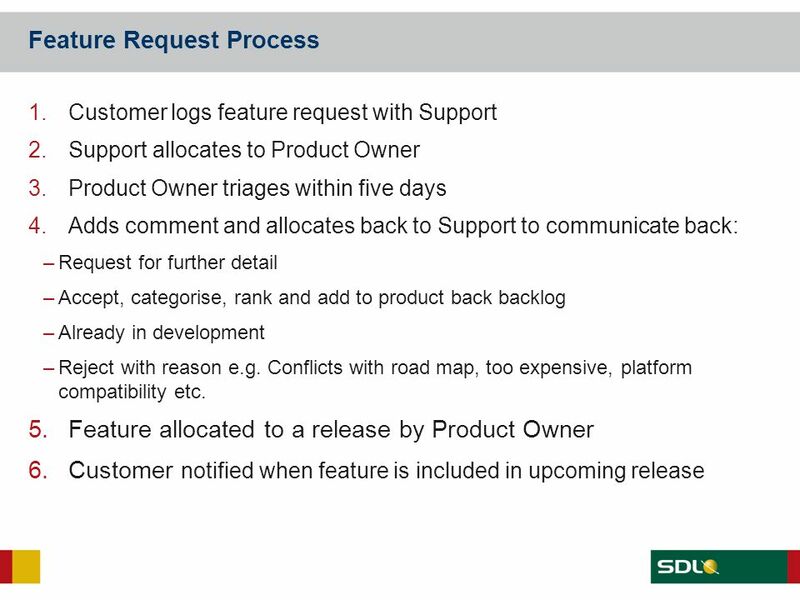 Customer logs feature request with Support Support allocates to Product Owner Product Owner triages within five days Adds comment and allocates back to Support to communicate back: Request for further detail Accept, categorise, rank and add to product back backlog Already in development Reject with reason e.g. Conflicts with road map, too expensive, platform compatibility etc. Feature allocated to a release by Product Owner Customer notified when feature is included in upcoming release Primary driver for new features is product vision and roadmap Moved away from Alterian days where features were sales led. Include detail and background What is the user story? How it would benefit existing customers? How will it help to win new customers? 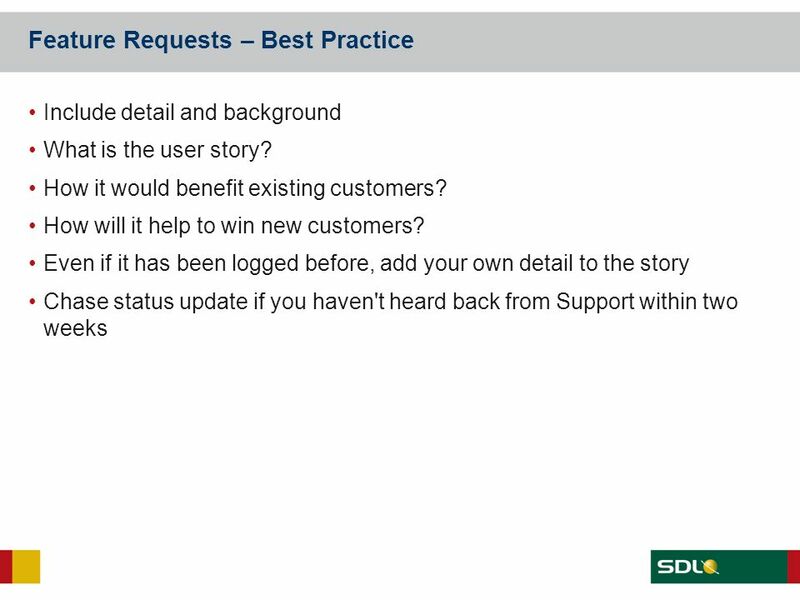 Even if it has been logged before, add your own detail to the story Chase status update if you haven't heard back from Support within two weeks Better too much detail than too little Example of a partner who logged a feature request on behalf of a customer who was a bank. Request accepted and shelved with low priority. Turned out it was due to a change to legislation to do with data protection and ban was breaking the law. 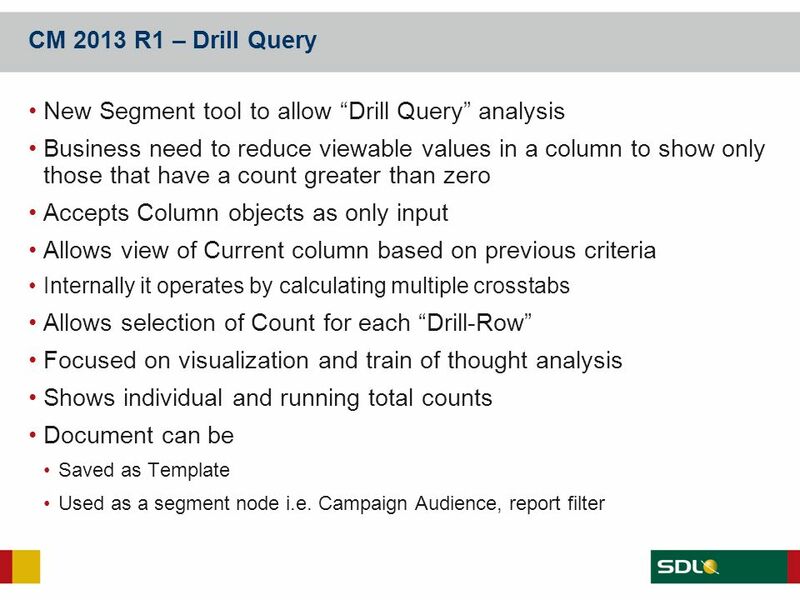 Customer Analytics All nodes respect the Engine Security of the “interactive” user. 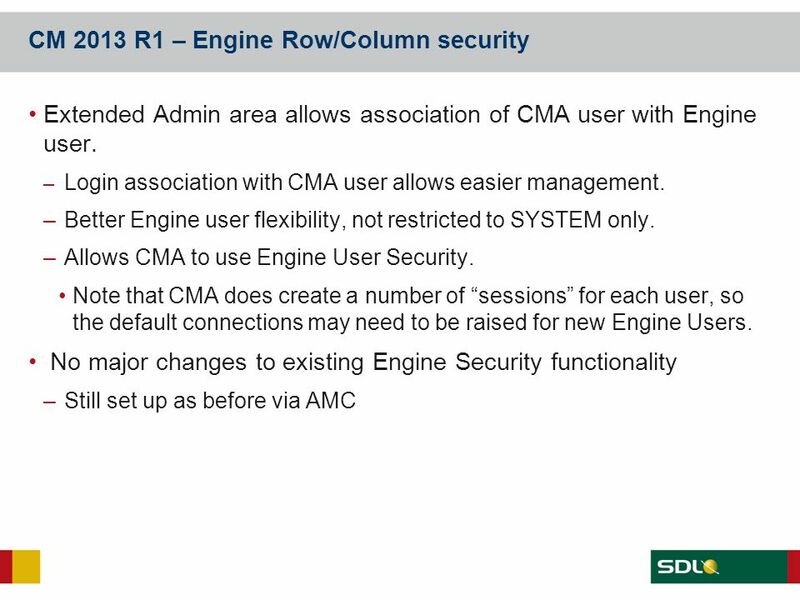 All active documents will respect the Engine Security of the logged in user at run time. Engineering nodes calculate “real” data based on the user, not a SYSTEM created column with security applied afterwards. 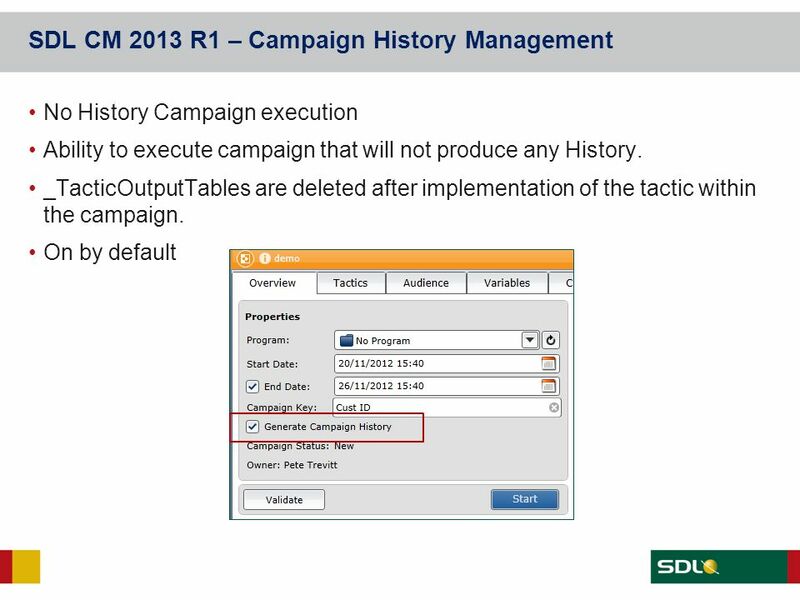 Has deletion implications as per AMS on named columns, where a user cannot delete another users column. 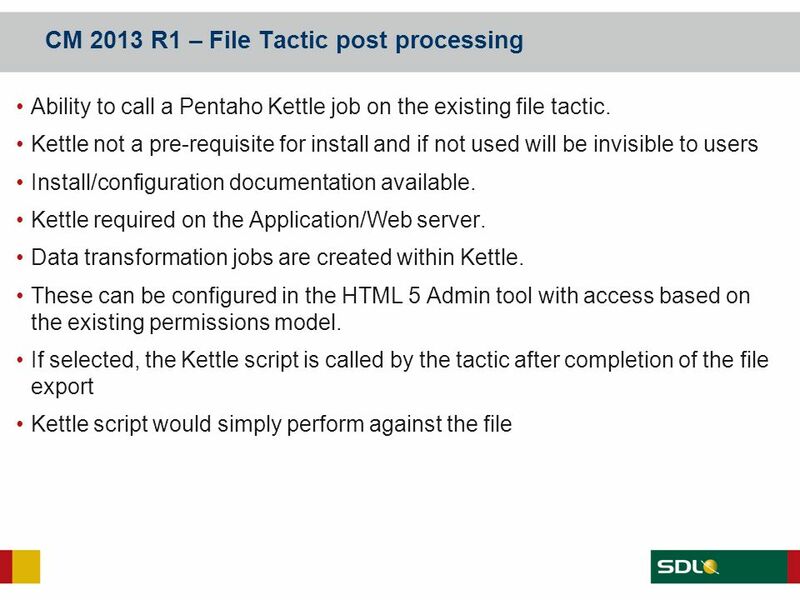 Scheduled Documents are run as the Document Owner. 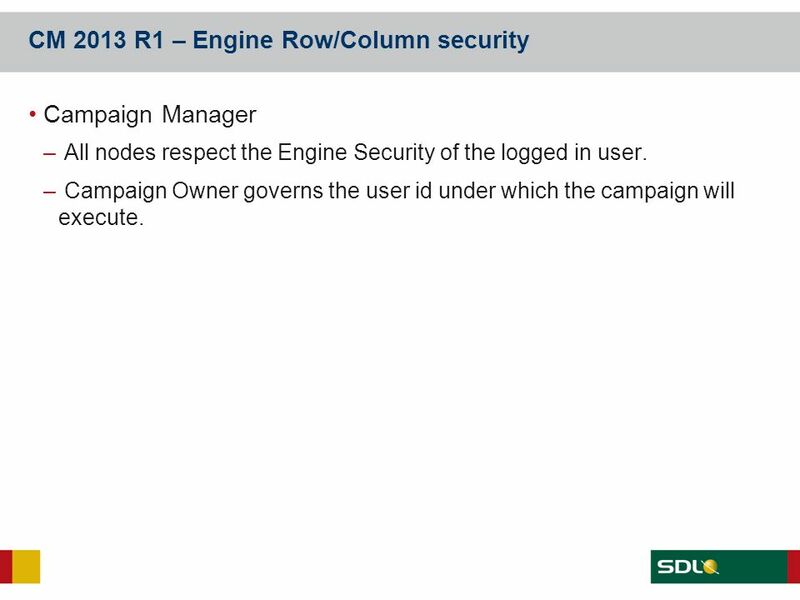 Campaign Manager All nodes respect the Engine Security of the logged in user. 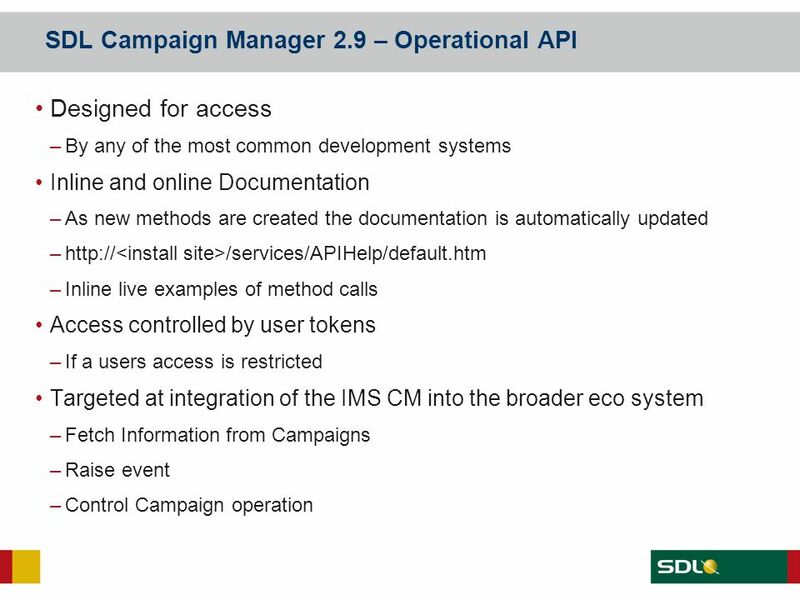 Campaign Owner governs the user id under which the campaign will execute. 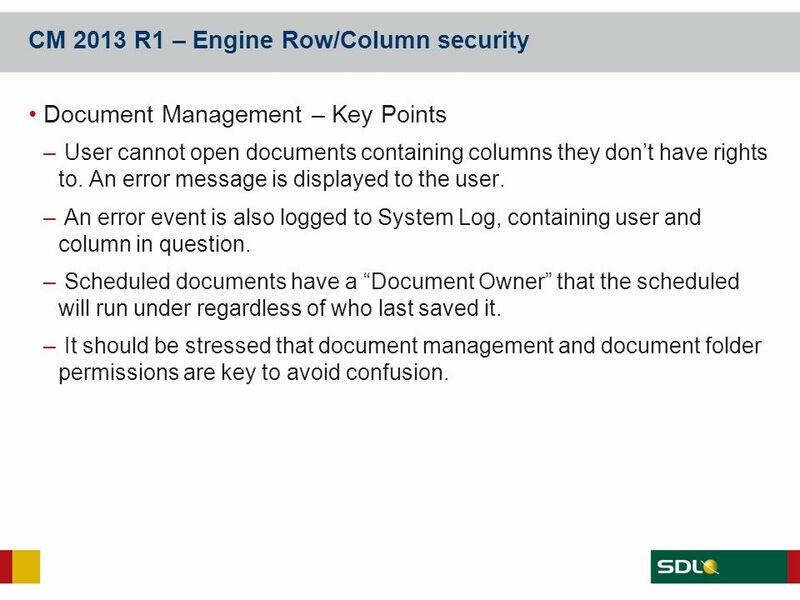 Document Management – Key Points User cannot open documents containing columns they don’t have rights to. An error message is displayed to the user. An error event is also logged to System Log, containing user and column in question. 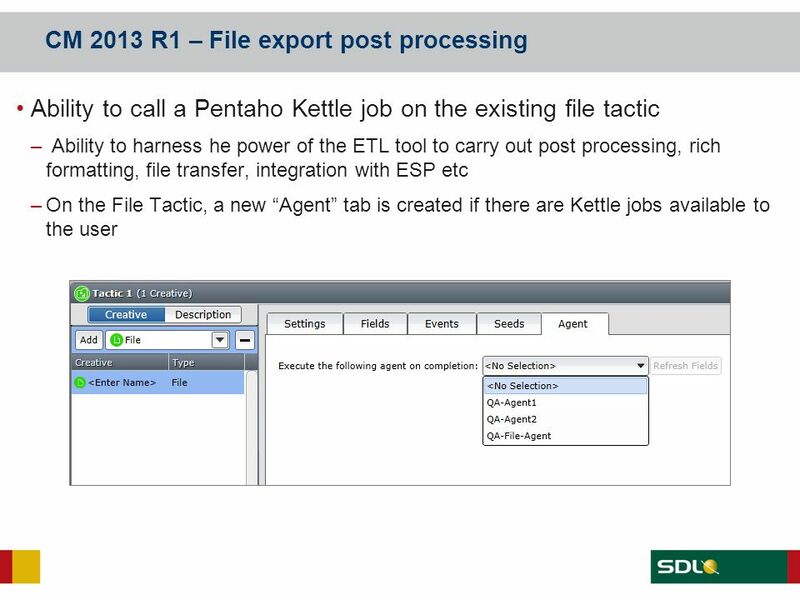 Scheduled documents have a “Document Owner” that the scheduled will run under regardless of who last saved it. It should be stressed that document management and document folder permissions are key to avoid confusion. 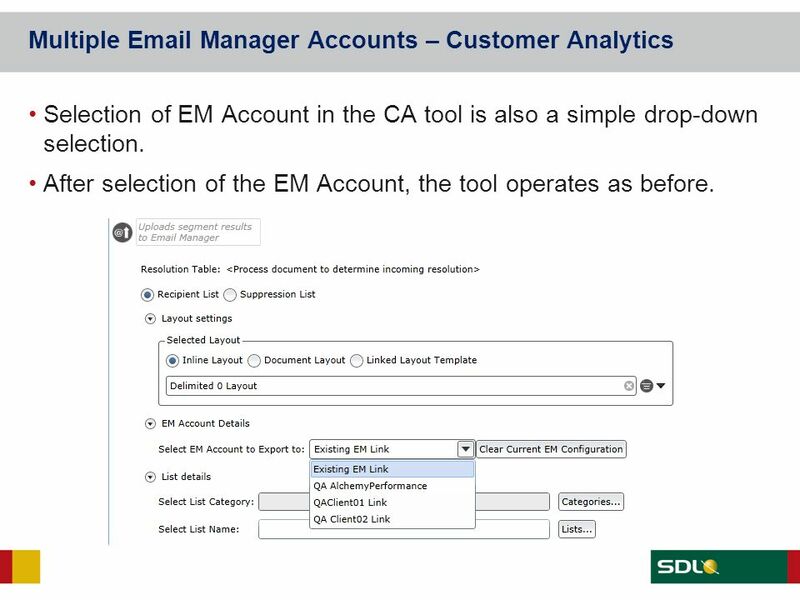 Selection of EM Account in the CA tool is also a simple drop-down selection. 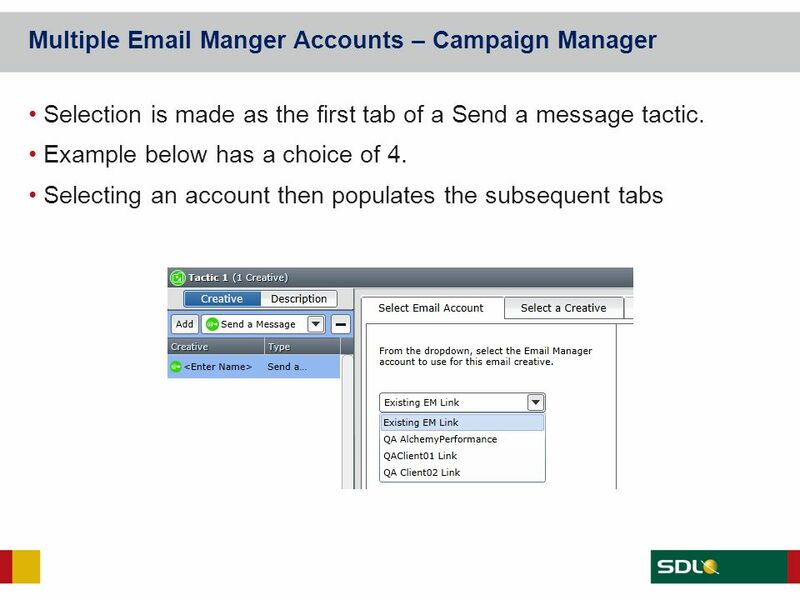 After selection of the EM Account, the tool operates as before. 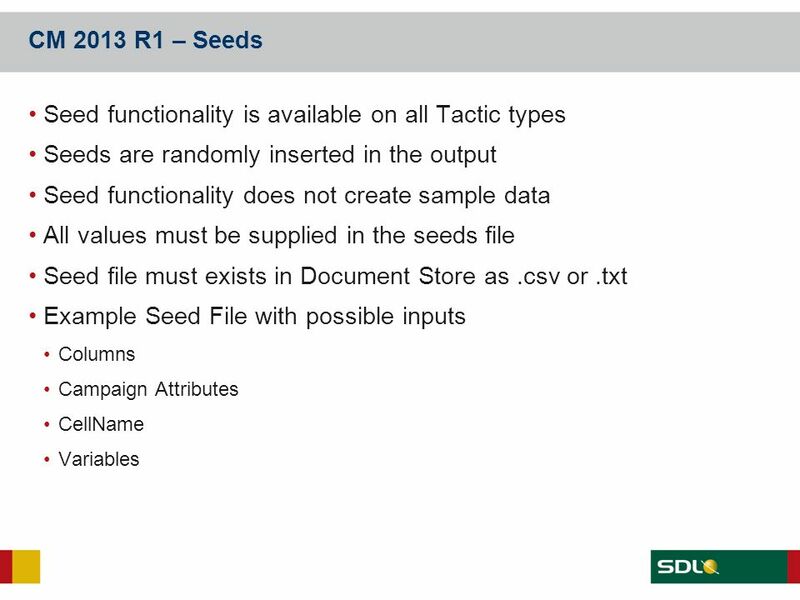 As a Campaign runs, its recipient state exists in ‘hidden’ Engine state Tables; on completion this data may not be required. 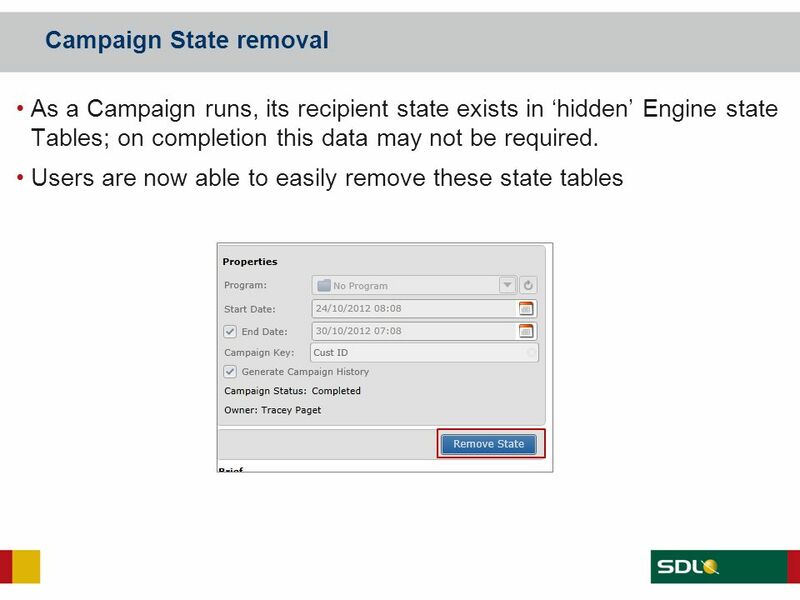 Users are now able to easily remove these state tables Campaign state exists in “hidden” Engine state Tables. 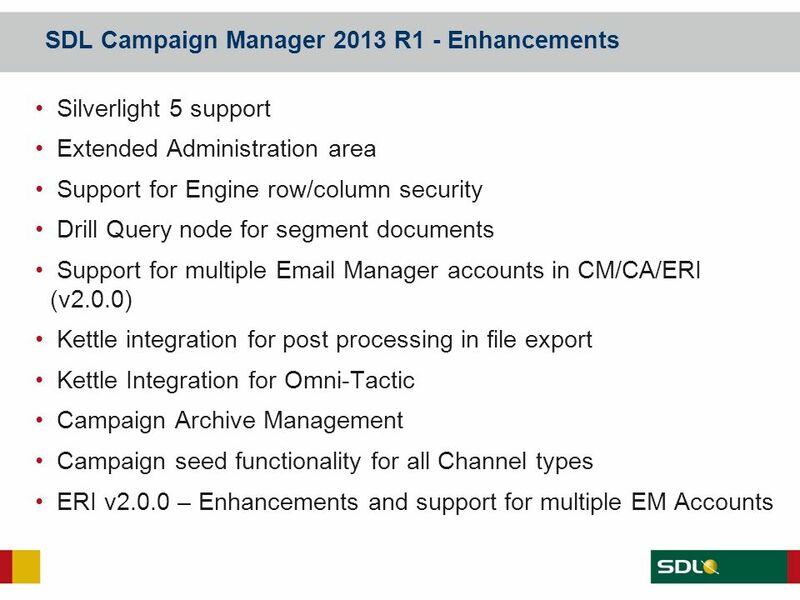 On completion of a campaign these may not be required. These can now be deleted by the user once campaign completed. Currently a user task only. 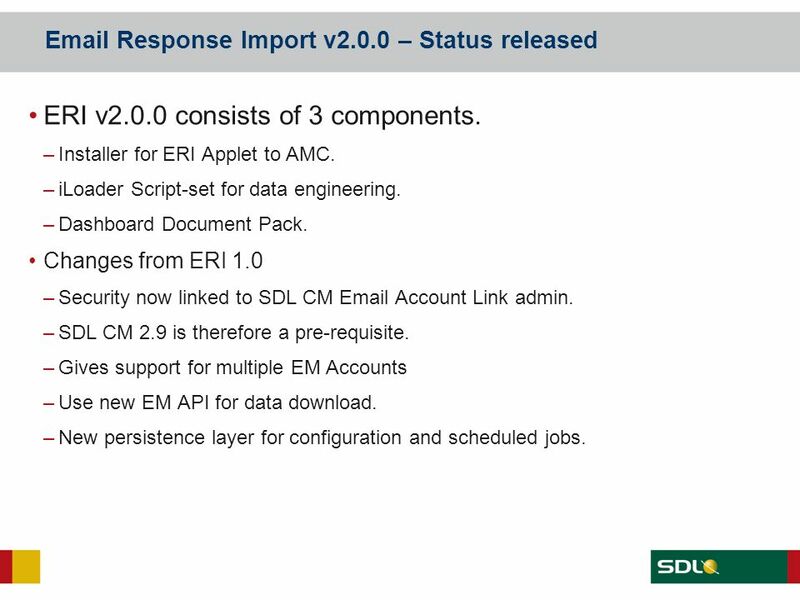 ERI v2.0.0 consists of 3 components. Installer for ERI Applet to AMC. iLoader Script-set for data engineering. Dashboard Document Pack. 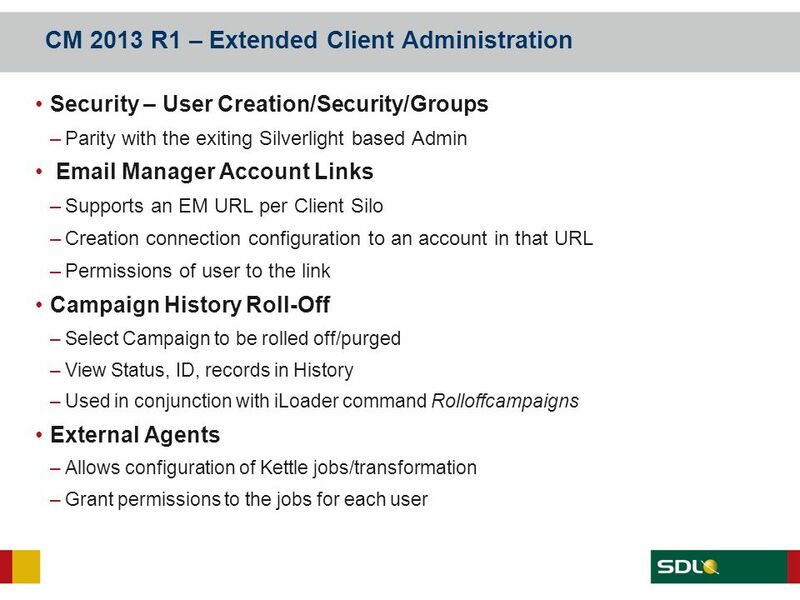 Changes from ERI 1.0 Security now linked to SDL CM Account Link admin. SDL CM 2.9 is therefore a pre-requisite. 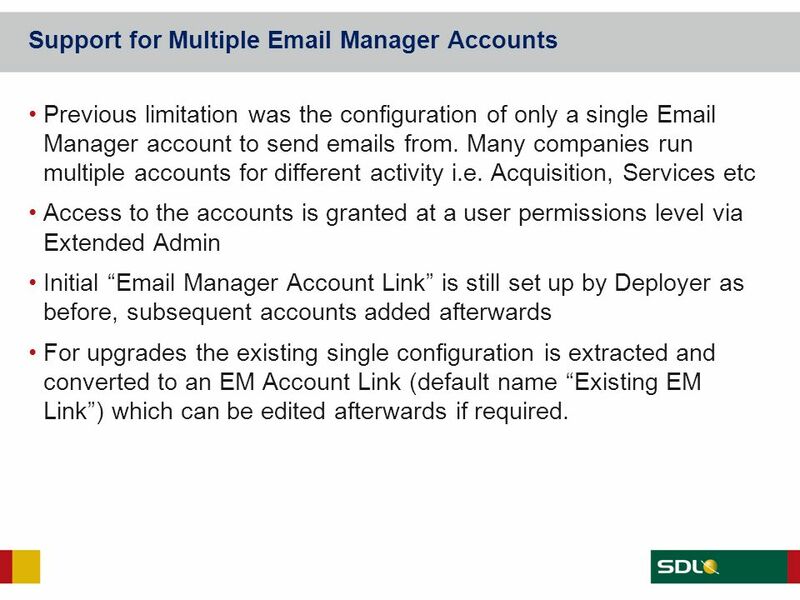 Gives support for multiple EM Accounts Use new EM API for data download. 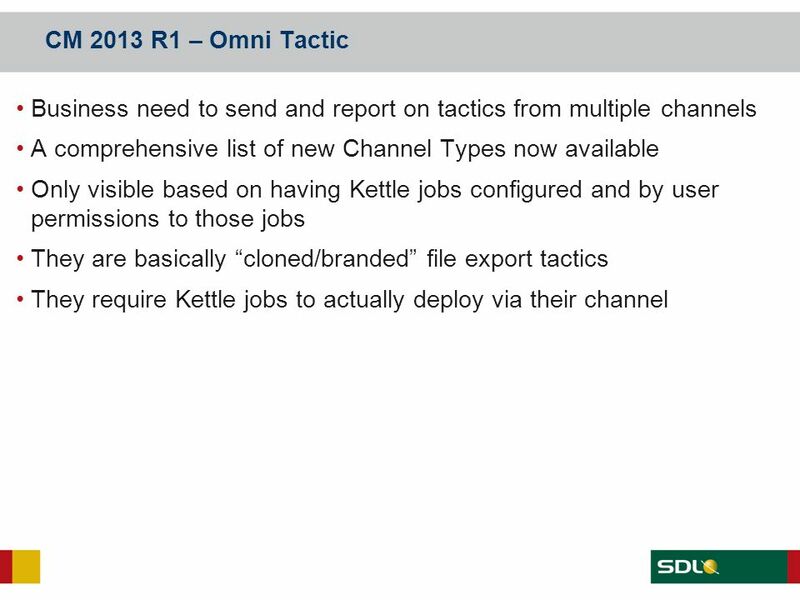 New persistence layer for configuration and scheduled jobs. 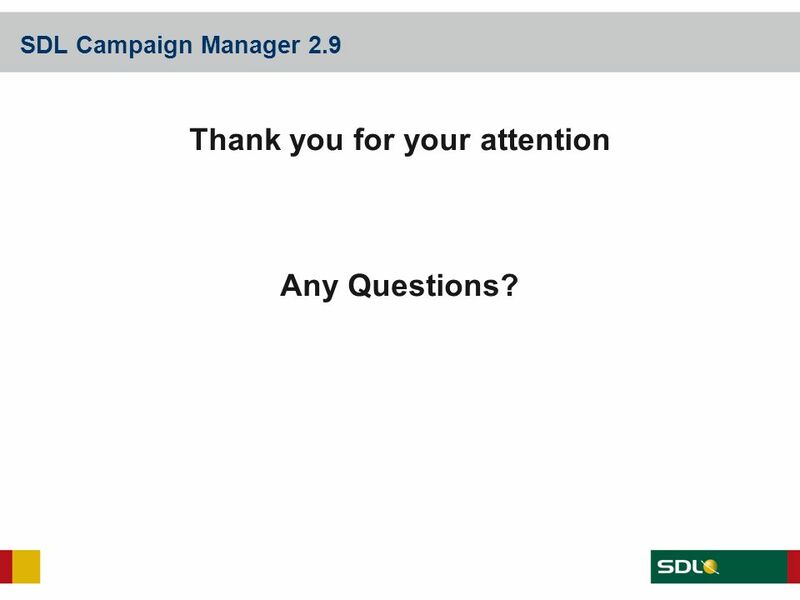 SDL Campaign Manager 2.9 Thank you for your attention Any Questions? 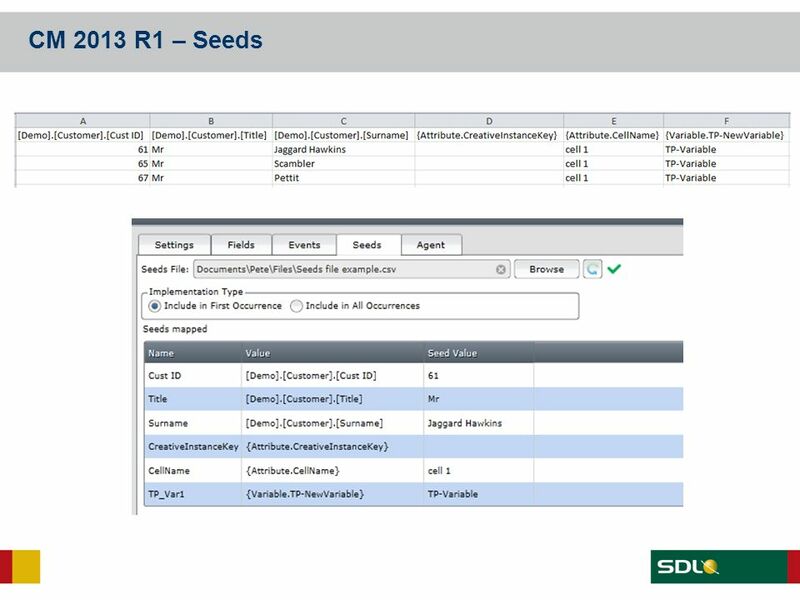 Download ppt "Feature Request Process"
Page 1 of 11 Lessees can submit individual Unit Values for their Production Entities if they do not want to utilize the default unit value. If no Unit. Course name : SAP BO 24*7 technical support faculty : Realtime experience Rs Trainings: is a brand and providing quality online and offline trainings to. 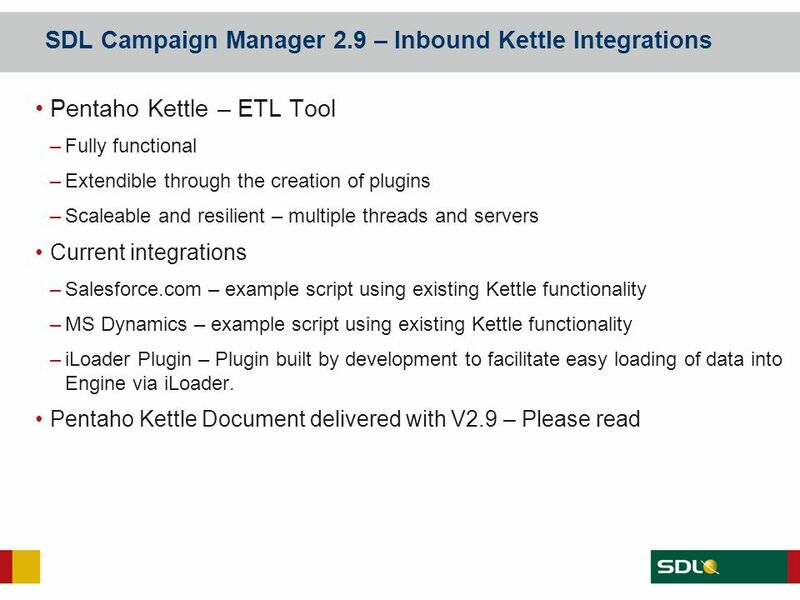 Salesforce Reports: Analyzing Your Data Meghan Butler IT Applications Administrator Root Capital. 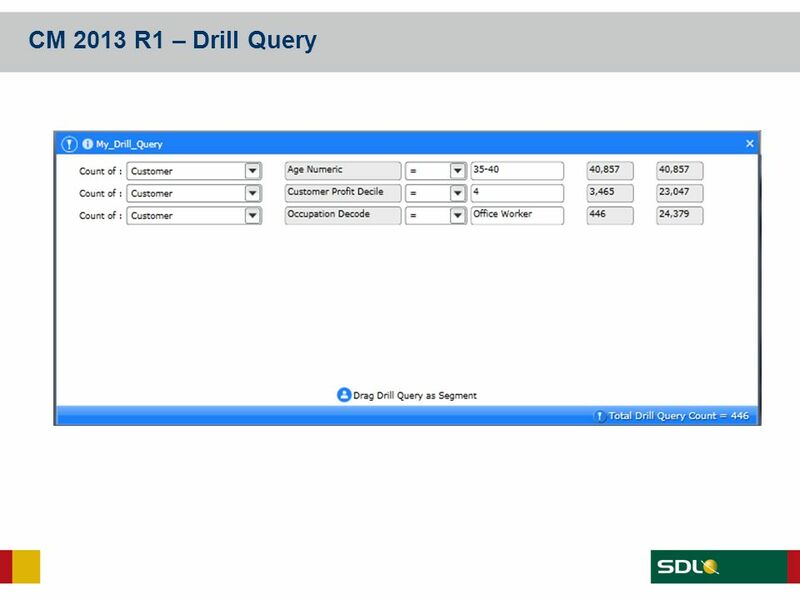 Benchmark Estimating – Company History benchmarkestimating.com Introduction to Version 7.6 for existing users Copyright Benchmark. 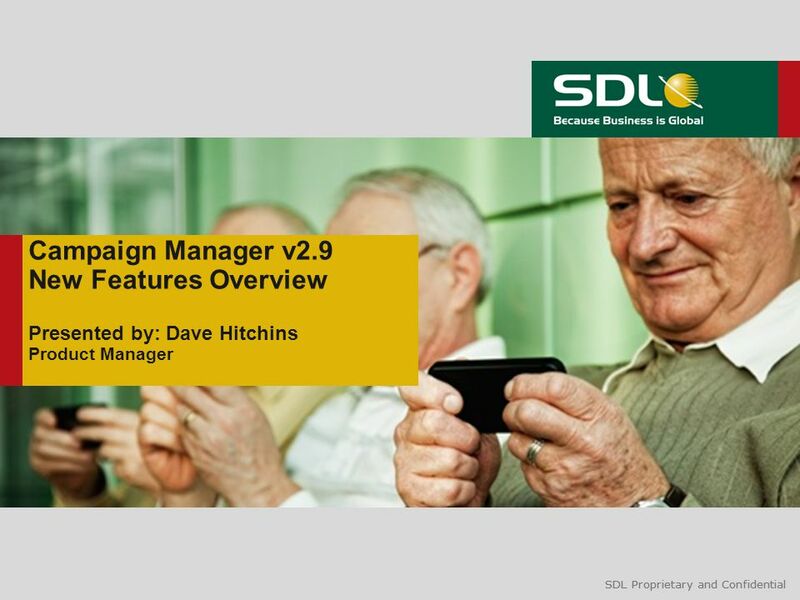 SDL Proprietary and Confidential IMS Campaign Manager Campaign Design Workshop SDL Campaign Management Solutions. © InLoox GmbH InLoox Web App product presentation The web client for project management on the Internet. Program Management Practice Program Management Portal: Overview for the Client © 2011, 2015 BM Corporation 1. © InLoox ® InLoox PM Web App product presentation The Online Project Software. Using the Engaging Networks tools Ghazal Vaghedi Toronto February 21, 2012 #12ENCONF. Broadcast service Core tools. 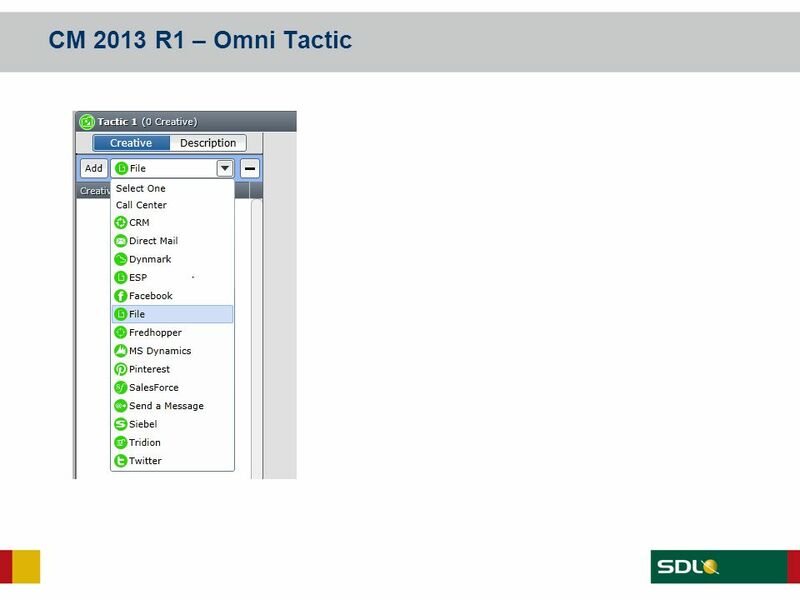 Agenda 1.Introduction – tool and its main features 2.Setting up and sending a simple broadcast 3.Achieving. 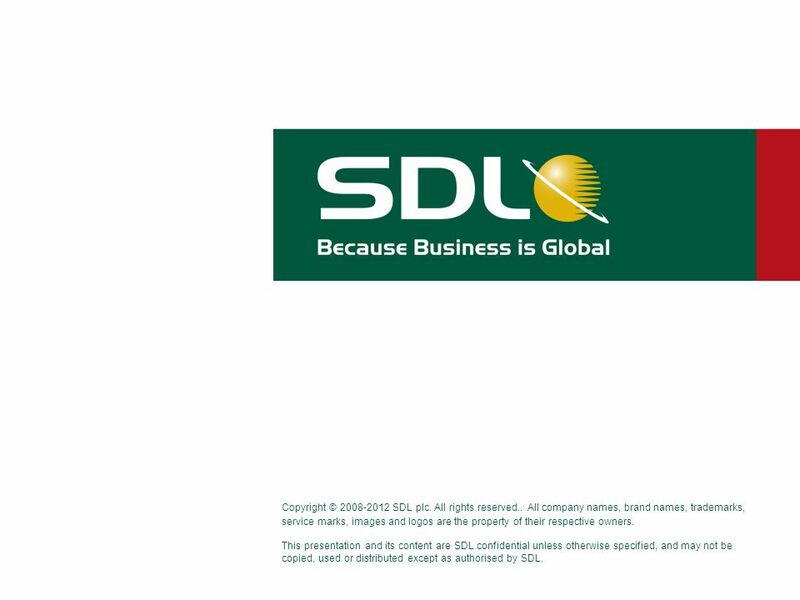 SDL Proprietary and Confidential Manager th June 2013 Ashley Mandell-Lynn Director, Global Production Services Martin Radford Business Solutions. ManageEngine ADAudit Plus A detailed walkthrough.